So I have two big hikes planned for this year (and some medium length trips and a whole bunch of shorter hikes). 7 day Salkantay to Machu Pichu and my 7 day Mt Williamson/Whitney trek. I have used a wooded hiking stick for the past 5-6 years ever since buying one on impulse before hiking down the Panorama trail in Yosemite and finding it helped this old body stay vertical. While they work well for me and has saved my bacon many, many times, I was wondering if trekking poles might work better for the long trips. After doing a snowshoe trek last weekend in Yosemite (got out before the big Sunday storm, fortunately), I started to wonder if using two trekking poles might be useful. *I can shift hands to avoid obstacles and balance better on a slanted trail. *On some hikes, having two poles may cause problems on narrow trails, especially on the edges of rock faces. *Easy to attach my medallions to keep track of my victories. *I can also stash one pole in my backpack if I only need one/find I don't need two. *Extra pole to keep track of. *Second pole sometimes gets in the way. *I found my snowshoe poles caused some discomfort on my palms when I wasn't wearing gloves during warmer parts of the day (might just be cheap grips that were made for winter gloves). Any comments or experiences from people who tried both? Here's what I have, only weigh 9 oz for the pair! The non-adjustability is something I had to get used to, and first pair I bought, I let an inexperienced kid at REI talk me into a set that was too long. The internal cord broke mid-hike (it was too short out of the factory, and I jerked it to get it to snap tight. The jerking action broke the string inside the handle. I repaired it with duct tape, and finished the hike. Next pair was shorter, and they are working quite well. The 9 oz part is what sold me on them. They weigh about half what most other poles do. Years ago, I thought hiking poles were for sissies. But I wouldn't hike without them now. The pair make me so much more stable, and when I try to use just one, I am quickly longing for both. I use one bamboo pole, about an inch in diameter and six feet long. Weighs about what two trekking poles weigh. A long stick is great for things like the switchbacks, where you can brace yourself below where your feet even are yet. Nearly indestructible and cheap or free. I put a rubber cane end on it. And it is very nice to have a hand free. Need to rig it up so it can shoot fire like Tim the Enchanter. I use those same poles, just bought them last year. Before last year I had the same sentiments about poles but decided to try them when my right knee was sore from overuse (running). Mainly used them on the downhill section to take the weight of the knee, but after the knee got better, I started using them only for the uphills. I actually broke the tip off of one of the poles during the early part of my descent off Whitney last fall, and fortunately REI exchanged them for another pair. Also I don't like using them downhill because you move faster and always have to be looking for places to stick the poles (where you won't break off a tip, lol), so it just seems like extra work to do. But going uphill they are great, allowing me to lean back a little more and it just seems to make the climb a little more relaxing and enjoyable. Interesting that you use them for climbing. I use them especially for descending, but I have a really bad knee, where I can't step down quickly on it -- the poles are a lifesaver for that. The sticks enable me to hike and carry a backpack at all! Since descending with poles is mandatory, I don't mind watching for places to plant them. I will use them descending on occasion, especially in areas where it's steep (but not too rocky, otherwise I'll just rock hop) or the surface is slick. But then I've only used them a handful of times, but I don't want to break off the tip again by being careless with placement (which it seems easy to do while descending and being tired). Well, pulled the trigger and bought the 120cm Black Diamond Distance Z trekking poles. Didn't think the $50-60 extra for the 3 oz lighter Carbon version was worth it. Still a little worried about the non-adjustability (but not enough to pay for the FLZ versions ), but the 120cm seems to be the right size for me. A bit higher than my normal hiking stick, but Time will tell. Promptly took them out for Stinson Beach to Mt Tam east peak trek on Saturday. Not really sure if they helped minimize my fatigue, since I was still very sore and tired after the 18 mile trek. They did seem to help on climbing and descending. Did occasionally find that the 2nd one got in the way when I stopped to take a picture, but wasn't as awkward as I thought it would be. Might be better once I attach my camera mount screw on one of them so I can use it as a monopod. That should alleviate the need to shift one to my left hand as I take pictures. We'll see if my next accent of Diablo will be easier with them. Do you put your hands through the straps? I use the straps, so if I want to take a picture, I just slide the straps up past my wrist, and let the poles hang. I never use the straps unless I drop a pole and then pick it up with the other pole's tip going through the loop. Straps can break your wrists and don't really do much for me any other way (and I have read all the smart articles about how to use them). I have maybe 1500 miles of rough terrain hiking with poles behind me, and I've fallen on my face/shoulder twice, in spite of poles. both times it was a good thing I got clear of the poles quickly to do whatever it took to protect my body. Well, from this page, I found a picture. This is how I use the strap. It allows me to barely grip the pole, when putting weight on the pole, since the strap supports all my downward force. 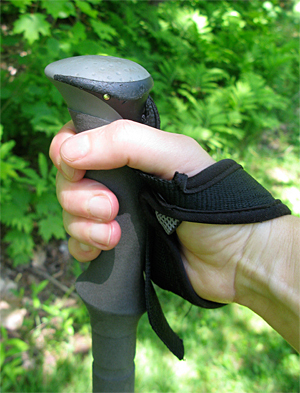 I get annoyed when I use a ski or hiking pole when the straps aren't adjusted for my hand. When I use gloves or don't, I have to adjust the straps. Well, after using the fixed 120cm poles for a few weeks, I decided they seemed a little high, plus wanting to be able to adjust them for going up or down steep slopes made me decide to return the fixed poles. So I ended up getting the Black Diamond Carbon FLZ adjustable z-poles. So far they seem to work great for me. I found that 115cm was the best for level ground for me. They definitely helped on my Salkantay to Machu Picchu trek. Well seasoned bamboo is the best IMO. 2' taller than yourself ideal. Light, flexible, very strong, versatile. Generated in 0.300 seconds in which 0.285 seconds were spent on a total of 14 queries. Zlib compression disabled.